Baby, I'm just soggy from the chemo. Home Baby, I'm just soggy from the chemo. 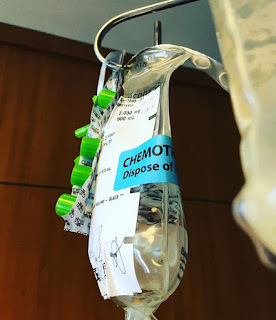 On the April 12th, I underwent the first round of chemotherapy for the stem cell transplant at Northwestern. I was given a rather large, private room, complete with a spectacular view of the Chicago skyline and a large flatscreen TV that I never used on account of the fast hospital WIFI and having my laptop with me. The nursing staff was nice. Friendly, chatty even, but not too talkative. They knew when to take a bow. They were quick to provide me with Zofran to combat the nausea from the Cytoxan. Sidebar, but isn't Cytoxan such an appropriately awful name for chemo? Cy-TOX-an? Toxic toxin. Eww. Anyway, they also gave me Mesna and Lasix, which left me having to pee pretty much every ten minutes for a couple of hours each time I was dosed. And of course, every time I went, I was accompanied by my beeping, infusing buddy, large IV stand, pictured below in the background. Yes, I still maintain my hippie style even at the hospital. The actual chemo infusion went fine, but the stay overnight was rough. I couldn't sleep, which is totally normal for many hospital patients. But what did me in was an overwhelming, almost to the point of smothering, feeling of loneliness. There was a pull out bed in my room, but it was empty, with K being back at the hotel with Zoe. We spoke via FaceTime... or rather, barely spoke, an awkward silence doing most of the communicating for us both. The day, with it's heavy anxiety, had left us both stunned and stung. At some point in the wee hours, my night nurse, Maria, checking on me during a pee run, noticed my sadness, and offered up some words of encouragement. Somehow our small talk turned to God, and with a thick Filipino accent, she shared how she prays for each one of her patients at the start of every shift, asking God to help her be an instrument for Him. Still lacking words, I gave her a hug, me still tethered to old large IV stand, her in crinkly, blue, antiseptic gown and latex gloves. I got home the following afternoon feeling surprisingly well. I had made several stops after being discharged to buy flowers (white lilies and pink daises) for our hotel room (really more of a studio apartment with a full kitchen) and to pick up the prescriptions I'd need for the next week. Things were still awkward between me and K, but Zoe greeted me as if we had been separated for months. As the hours passed, I fell into a daze of exhaustion, finally conking out before 8PM. Around 2AM, I awoke to what felt like an actual wave of nausea. For the next 36 hours, that wave would submerge me into some kind of hellishness akin to labor pains, premenstrual cramps, and the most severe stomach virus ever... combined. I'd pop a Zofran, which, as far as life preservers go in an ocean of nausea, kept me afloat, but most certainly didn't save me. Food was a step away from gross. I wasn't even too keen at looking at it. The only thing I wanted to see was my family. In fact, from my groggy, soggy chemo haze, laying in bed, I set my gaze on K and Z. It didn't take long for them both to question my stares. I mumbled out how much I missed them. Zoe shrugged, laughed and went back to watching TV. K met my stare with a look that crossed incredulity with being weirded out. I had been warned that this process would leave me physically depleted. There were no side effect warnings for my emotions.